Zac Efron: Z.E.N. Foods Lover! 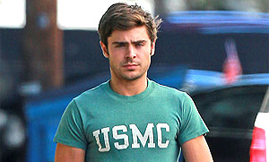 Zac Efron has his hands full as he goes for a stroll on Tuesday (June 12) in West Hollywood, Calif. The 24-year-old actor carried the same Z.E.N. Foods bag and backpack that he carried around the day before. On Monday night, Zac attended the final game in the Stanley Cup series between the Los Angeles Kings and the New Jersey Devils. The Kings defeated the Devils after a six game series. FYI: Later in the day, Zac caught up with a pal at Chateau Marmont.